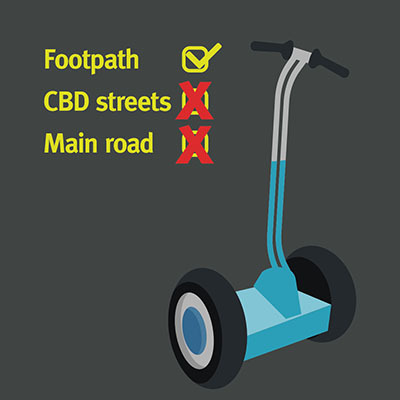 A broad range of personal mobility devices or rideables can be used in public spaces and road related areas in Queensland. You must comply with the road rules to use them. Remember, people of all abilities use our paths and not everyone can easily move around a device that is obstructing free movement. For everyone’s safety, ride in a safe and respectful manner, especially around pedestrians. Rideables don't need to be registered. have a working flashing or steady white light on the front, and a red light and reflector at the rear when travelling at night or in hazardous conditions. Keep left and give way to pedestrians. Travel at a speed that allows you to stop safely to avoid colliding with a pedestrian. Travel at a safe distance from a pedestrian so you can avoid a collision. Keep left of oncoming bicycles and other personal mobility devices. Only use the bicycle side of a shared path. Rideables should be used on paths wherever possible. Some limited access to roads is permitted but only in specific circumstances. For example, you can use your rideable to cross a road or avoid an obstruction on a path for up to 50m. You are allowed to stay on your personal mobility device to cross a road at a designated crossing. You can also ride on local streets, where it is safe to do so. A local street is a road with a speed limit of 50km/h or less. It must have no dividing line or median strip and if it is a one-way road, it can’t have more than one lane. You must not ride on main roads or streets in the Brisbane CBD. When permitted to ride on a street you must keep as far to the left side of the road as practicable. Just like bicycle riders, you may ride alongside 1 other person or vehicle travelling on a road in the same direction. However, you must not cause a traffic hazard by moving into the path of a driver or unreasonably obstruct the path of any other road user. 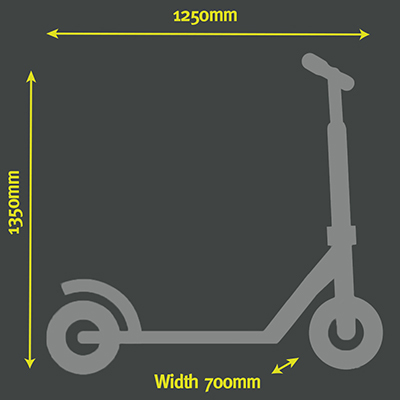 ride within 2m of the rear of a moving motor vehicle continuously for more than 200m. You must not travel past a personal mobility devices prohibited sign—your local council or land owners may prohibit personal mobility devices in areas like malls, esplanades or jetties. You should also contact your local council to find out if there are any local laws that apply to the use of rideables. If you get caught not complying with these rules you will be fined at least $130. If you are using a hired rideable you must leave your device in a safe and responsible way having regard for other path users. Hire companies may have additional conditions of use in addition these rules. Hire companies must consult their local council or authority prior to deployment.